Charm at the Farm is an open air shopping vintage market located on a 56 acre farm in quaint Lebanon, OH, just north of Cincinnati. 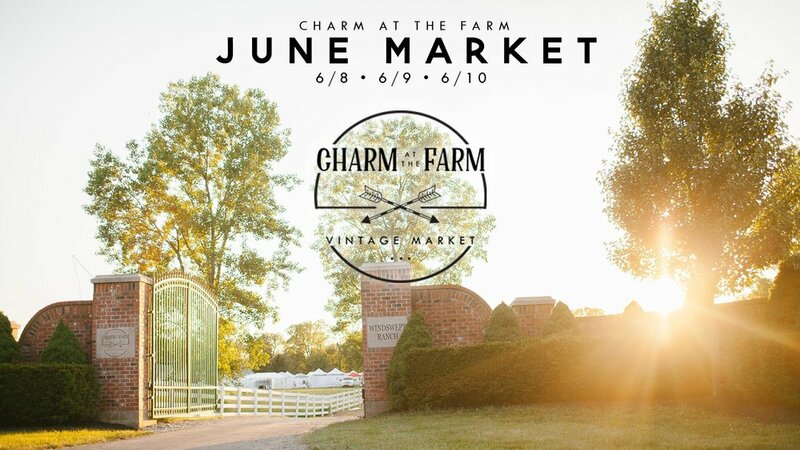 The best local artisans and shops come together only three fabulous weekends a year exclusively at Charm at the Farm. This innovative market provides rustic gifts, furniture, and home decor all in one vibrant place. Charm at the Farm is the only place in Greater Cincinnati where you will find only the best pieces from all of your favorite local shops all in one place. It's not just a market ... it's an experience. Grab your friends, gather your fam or get a sitter, and mark your calendars now to come shop our amazing selection of treasures! Voted Cincinnati’s best girls’ day out! Thousands of unique gift ideas, 350+ boutiques, one brilliant destination—plus a wine lounge for relaxing and toasting the holiday with friends. Find everything you’re looking for (and a few things you didn’t know you needed) at the season’s best shopping event. NEW THIS YEAR: Bigger show floor, wider aisles and extended hours! Kids 12 & under get in FREE with a paying adult! Come and join us the 2nd Saturday in May to shop local pop-up shops in a park setting. Bring the husband, kids and even your furry friend to enjoy some sunshine as you stroll through the park, shop handmade goods, drink craft beer, eat from stellar food trucks, and enjoy FREE yoga on the lawn in the morning. Local artisans and shops will be set up until 4pm. Hamilton City Flea is a free event, and open to the public rain or shine! Please feel free to bring your dog along and check out our Hamilton Flea beer booth for a doggie water bowl. An upscale market of 100+ vintage and handmade vendors, food trucks and live music held inside a historic Round Barn and the charming grounds of the Fairfield Co. Fairgrounds in Lancaster, Ohio. Friday, May 4th 4-8pm "First Bloom Party"
It's VIP night! An Early Bird shopping experience for those of you that just can't wait to get first dibs on all the good stuff! The lines are shorter, and the shopping is a little more intimate so you can meet the makers. VMM Swag Bags for the first 100 in line (and these are totally worth waiting in line for!) filled with goodies and coupons from our vendors. Most vendors offer VIP night only specials on Friday night too! Just 1500 discounted tickets will be sold online. Print your emailed tickets, or go green and we can scan them from your phone at the door. Scanning on your phone is the preferred way to go to keep that line of anxious shoppers moving quickly. Saturday, May 5 9am-4pm "Spring Market Day"
Our local vendors will be restocking and refreshing all those awesome goods in their booths! $5 per person at the gate. LIVE MUSIC by Nashville artist (and American Idol Top 16 finalist) Alexis Gomez on both days! FREE Parking both days. Pet and stroller friendly. Come join us for the FOURTH Ruffles & Rust Show at the Butler County Fairgrounds in Hamilton, OH! Come sip wine and shop our hand built one-of-a-kind lighting, limited edition curated boutique clothing, our Ohio made candles and much more! Plus there will be a hundred other vendors just a fab as us to also shop.